PICTURE this: a cozy café that's so inviting you'll want to linger over your morning cuppa well into afternoon tea. Now imagine this space is completely and utterly sustainable. Enter Slow Poke Espresso. 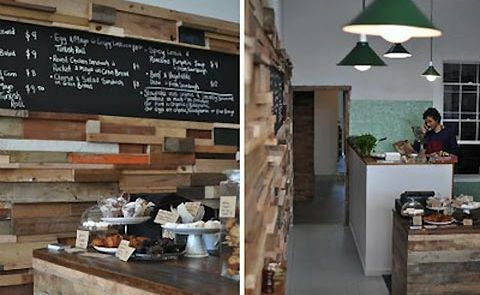 Everything at this recently opened café in Fitzroy - a popular suburb of Melbourne - is organic, sustainable, recycled, and reused - and we mean everything. Timber offcuts made of local furniture creates a puzzle-like 12 metre-long wooden wall that runs the length of the café. The tabletops are made from recycled floorboards, the signage is charged by a solar panel sitting atop a recycled wooden toolbox, and most of the building materials - from tiles to lamp shades - were locally sourced at neighborhood flea markets. Even the business cards are made from handcut recycled cardboard packaging. Of course, the food too, is local, organic, biodynamic, and free range. Word on the street is that it's delicious too. Between the gorgeous eats and welcoming space, Slow Poke Espresso will surely tempt you to slow down.